I've been succeeding at my Buy Nothing New pledge, only buying what is allowed on my list. It hasn't been a problem, it's almost been too easy. One of the few things I've had to break down and buy new were some replacement shoes. Do you have issues with second hand shoe shopping? I have no problem with the "ick factor" of used shoes. We live in a great big world full of ick and retail stores have germs, too. What I've been having trouble finding at the thrifts, are shoes that don't betray me. They strike back, breaking or suddenly becoming uncomfortable, every time. I started a new process for shoe shopping that I thought would keep my shoes from breaking or fitting improperly when I get them at the thrift. If shoes are needed, I went to the shoe section first, selecting the promising pair. I would then wear these shoes for a long while, shopping through the store in them. If they survived and caused no discomfort, I purchased them. But this method didn't work, every pair I bought either caused discomfort later or broke. This weekend I took two steps outside the thrift store and a pair of shoes I'd just purchased, which were like-new and lasted through lots of shopping...broke. There was no sickening snap to give it away, only a sudden wobbliness that revealed an inexplicable break. It's the curse of broken shoes, I tell you! 1) The like-new or brand new shoes are donated because they're uncomfortable. 2) The shoes may look new but they're actually well-worn and break easily. 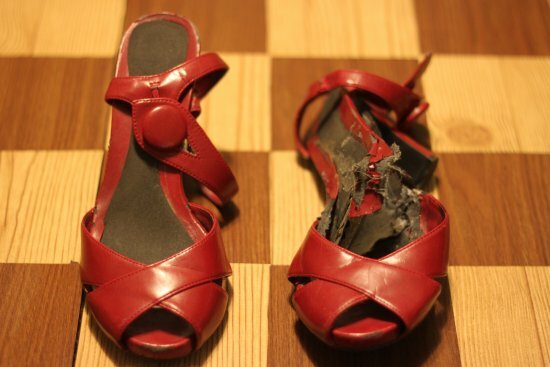 3) I walk a ton on the weekend and whore out my poor shoes; they break from the stress. I ran in and out of retail stores for months, looking at prices and then retreating. Finally when my last pair of shoes broke (and I'd been wearing flip flops to work for a few days) I broke down and bought new shoes from Famous Footwear on a friend's recommendation. I was thrifty about shoes for years. I haven't bought a new pair in 4-5 years, and replacements were usually hand-me-downs from my mom or friends. I even duct taped the red pair of pumps pictured above in a sad attempt to get some more wear out of them, but they imploded. Sometimes you just have to break down and Buy Something New. I don't feel like I broke my Buy Nothing New pledge rules too much. Shoes; you kind of need them. Do You Buy Shoes from the Thrift Store? What are your shoe thrifting rules? I only buy used shoes when they're brands I would normally buy, (Danskos for me, Vans for my sons) and they look brand new. I do buy new shoes sometimes though. I am a nurse and am obsessed with comfortable shoes. I dislike retail shopping and wear secondhand clothes every day but the one thing I usually buy new is shoes, mainly because I have big feet 9/12-10) so there are a lot of options at the thrift. Luckily in the past year or so I've found lots of gently used shoes at Buffalo Exchange, the quality is much higher there and they're unlikely to break. I've also gotten nearly brand new designer boots (2 pairs) there as well. If you want to buy new I'd also recommend DSW shoe warehouse, reasonable prices for better quality shoes. I have bought shoes from Thrift Stores, I'm very selective. I only buy ones that look new (check the soles) and are a high quality brand. However these are not the shoes I wear everyday. Why? I usually have a specific brand/style in mind for everyday that I will not come across at a thrift store. AND you need to invest in your feet - they are going to carry you for the rest of your life - treat them well! You did the right thing. Katy: I find so many like-new shoes, shoes in boxes, shoes with tags... I love thrifting for shoes, I just haven't had much luck. Thriftaholic: Lucky! In all my adventures, I have never found decent boots! They are rare indeed. I'll have to check out DSW, thanks for the tip! Jil: Thank you for the reassurance! I love very expensive shoes and purses...at my age this is a right not an extravagence! About 7 years ago I discovered Tods an Italian made shoe that retails for $400 and up. I frequently by the used ones on ebay for around $50. I look for like new pairs and a size 39 always fits. I get complements all the time about my shoes. I have bought shoes a few times from thrift stores but it's harder to come across the right style, size and quality. I've been there, not a thrift shoe in sight I can wear. Lately the extreme opposite and I wear some serious niche shoe's. I cycle and spin, I need cycling shoe's, I'll also need clips, the clips alone are usually 28.00. I found two brand new pairs WITH clips, my size and I use them daily. Lately, hiking, comfort, brand new flats. It seriously is getting a little crazy. I guess the morale is don't give up! Kinda crackin up over your shoe's breaking though, I have never had a pair break on me. I don't wear a lot of heels though, is that it? PS before I forget, try resell and consignment stores, too. They typically are a higher price than thrift stores, but they usually carry great brands for the price of payless. 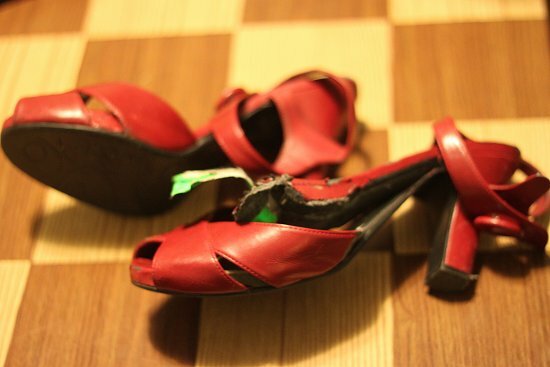 I can identify with your traumas, but I have had a lot of luck in thrifted shoes, too. One thing I've noticed is that if a thrifted pair of shoes isn't quite right for me, I feel quite brave about snipping a stitch here, removing that bit there, which I never would dare with anything expensive. I have wondered if that's why my thrifted 'new-looking' shoes suit me more than they did their original owner. I've had some GREAT thrifted winter boots in my time, too. Spell check 3) I think you meant "wore" out your shoes, if not they are probably breaking since you "whore" them out and they are tired!! I think it's a comical word error based on the whole subject of the post. Anonymous: I meant "whore" ;) It's a verb in my book. To "whore out" something means to use it up, abuse it...I definitely do this to my shoes. I appreciate your vigilant spell checking, though! Thank you. 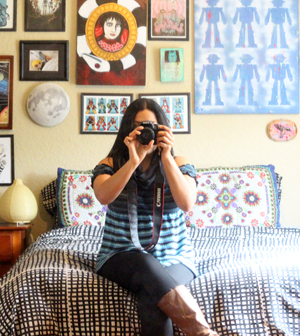 I have always been lucky with thrift shoes...my latest post on Charmstruck even proves it. So far the shoes I've purchased have been comfy. But you do seem cursed, I mean, when I saw those heels, I thought a little dog had got at 'em. Lol How they broke like that right out the shop is beyond me! I'm also lucky that me and my best friend are the same size. Sometimes for high heel events we help each other out and trade, that way we don't have to buy another pair of shoes. no problem here, although it is like a rare unicorn if i can find cute vintage shoes in my size! that is the real problem! if they are a little gross, then a little water and vinegar will do the trick! You might have better luck at a consignment store. Things there are usually of better quality and only gently used. Also if you have a particular pair you like and you see them staring to go, take it in to a shoe repair place to see if they can be salvaged. I will buy used shoes if they are a brand I wear and lightly used. Or if it's for a one time gig like a costume or a wedding. I will spend money on quality pairs of new shoes because I want them to last and I'm usually on my feet all day. DSW is a great resource and I frequent 6pm.com online. I do both I guess. I have no problem buying shoes from the Thrift Store...but they haven't to fit perfect! I learned the hard way, buying multiple pair of shoes that were "almost" right. That's a great idea about wearing them around the store! I'm definitely going to try that! I buy second hand shoes if I see them and they fit, but they've usually been just the odd pair of heels - I got some Armani shoes recently for £20 which fit perfectly and are in really good shape. I've yet to find a really nice pair of boots which fit from a charity shop, and day to day I tend to wear converse - I buy those new. Sorry to hear about your problems - I guess you've just been unlucky and picked up the shoes which are more worn than they look. Jackie: To clarify, the shoes pictures are ones that broke with lots of wear from me! They looked like they were mauled by a cougar, not a small dog! Monogirl: In the past, I've had shoes from consignments shops break, too! I'm really just too hard on my clothing! Lakota: It's been amusing, nothing to be sorry about. At least the shoes that broke have all been relatively inexpensive. Floss: That's one thing I love about thrifting for clothes or shoes, with the low cost there's no guilty about making alterations for a better fit. I do it with dresses all the time. Wow. I almost only buy used shoes, always. my one exception is running shoes, only because these need to support my feet well when i excercise and runners that come into thrift shops are usually too worn out. even there, i found a pair in the fall that were like new, newbalance runners that fit like a glove and i've been wearing them a ton and they're perfect. i usually do exactly what you did, go to the shoe section first, try on a pair that i'll wear around the shop and if they feel comfy throughout ths store, i'll buy them. i've rarely gone wrong using this method. i do try and be selective with brands and occasionally i've reheeled or resoled shoes and they're still cheaper than buying new. so my conclusion is that you do, indeed, have a shoe curse. bummer! I think TRYING to buy shoes you can wear counts. I mean you basically tried but you really need shoes that fit and are comfy so you HAD to get them. I have found shoes in the thrift store I loved and some that sucked. I've bought TONNES of shoes second hand and have had successes and fails. Probably my best find were my Pradas that I found for £10! They are SO comfortable it's ridiculous. I also have found boots, trainers and sandals. Although I'm not going to berate myself if I do buy very comfy shoes that are new as being a teacher I'm on my feet all day so I need shoes that are comfy! The day before you posted this I bought three pairs of shoes from a thrift shop. I wore one pair all around town today, worried the whole time they'd break. If they had this would be a post about you spreading the curse! I'm happy to report that the shoes held up though. Good luck with your future thrifty shoes! I wouldn't give up on them. Some of my favorite shoes are thrifted! This is what I collect.... shoes. lol I love shoes. I have so many pairs of heels that I love so much, but I don't wear them very often. I buy all kinds of them at thrift stores, but I inspect and inspect and inspect them before I get to the register... and then I check them again. I always try them on. I'm not afraid of the ick factor either. Lysol disinfecting wipes are AMAZING. Oh, and you didn't break your vow. New shoes are a necessary evil in life... for everyone. Sometimes it's just unavoidable. No thrifted shoes here. I wear DVS, DC, Etnies & you aren't going to find many in my size (11) that are not trashed in the thrift store. Plus I've got a thing for new shoes. On the topic of shoes, the BF & I were in the shop the other day & a woman came up to the counter with a pair of shoes shouting at the top of her lungs. Turns out, they put a pair of shoes on the shelf (complete with a tag!) with dog crap all over them. I think it's funny how people are obsessed with "like brand new" and "high brand name" shoes. I only buy shoes secondhand (like everything else in my life) and I find that the most comfortable and long-lasting are shoes that are already worn in (but not worn out!) and that don't have a brand name. I have a few pairs of actually stylish running shoes, a few regular sneakers, and I just bought a pair of leather loafers last weekend while on vacation in NYC. The loafers were so fantastic that I wore THOSE around the city throughout the weekend because they were more comfortable than my "new" "brand name" sneakers I had gotten as a gift! Really, it's all about timing and finding the right place to look. Don't give up on secondhand shoes! oh, and I have to add: I wear a size 9 1/2 in women's, which is NOT a common find in a secondhand shop - and I still manage to come out with a good pair every so often. I buy shoes when I thrift. However it depends on the condition they're in. Sometimes you come across shoes at the thrift and they should have been trashed no matter the brand. Trash is trash. Now if I purchase a pair that is in need of repair I will leave that up to a professional. I find amazing shoes at Goodwill - today I bought a pair of Anne Klein and Cole Haan Mules for $16.00 for both pairs and they're in spotless condition. I always check and make sure they are lightly worn and are in good condition - I'm not going to pay more for shoe repairs than I paid for the shoes (unless I've worn them for a good while). I love picking up shoes at thrift stores. They have to in good condition,maybe new heels,but otherwise clean.What I is that there stretched out a little and thats great for heels.Im a big girl so when I find a great pair of shoes that I like and they fit Im thrilled.Yesterday I tried on a pair of red mules with about a 3" heels and they fit perfect. But what did I do? Said to myself I have to many shoes and walked out. Im going and back today,hope there still there. Poor you and your poor shoe too! That shoe waited so long for a new owner only to die in her hands (I mean, on her feet). I notice it's been a while since this post. Have you had any luck with your shoes since then? A pair of shoes are the main thing have purchase and keep safe from slip and fall injuries..